This entry was tagged Goals, NaNoWriMo, National Novel Writing Month, The Writing Process, Writing. Bookmark the permalink. I learned the same lesson in the spring. I finished a manuscript in record time–six weeks–and afterwards I felt so burned out that I decided I deserved a break. But after just a week away from writing, it took almost an entire month to find my groove again. Now I don’t take “breaks”, I take “breathers,” which never last more than a day. So true! A week away doesn’t seem like a lot but it’s enough time to lose touch with your characters and the story as a whole. I love your “breather” concept! I’m taking a break, too, but I’m already missing writing! 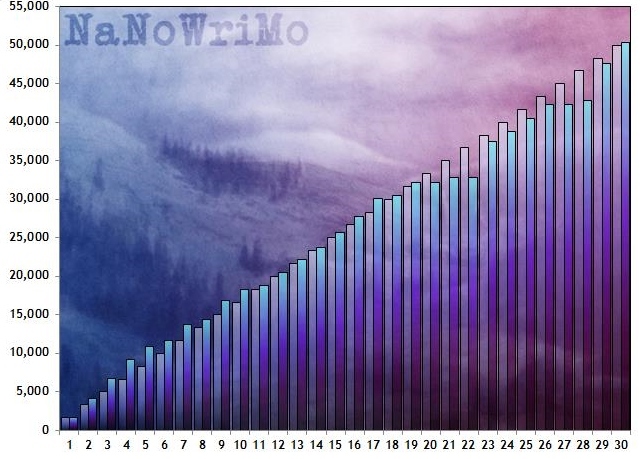 So when I do start again, I think I’ll take on a smaller goal — maybe 1000 words a day or so. My NaNo experience was the same, I decided to take a break afterward and it took months to get back into the swing of writing again!